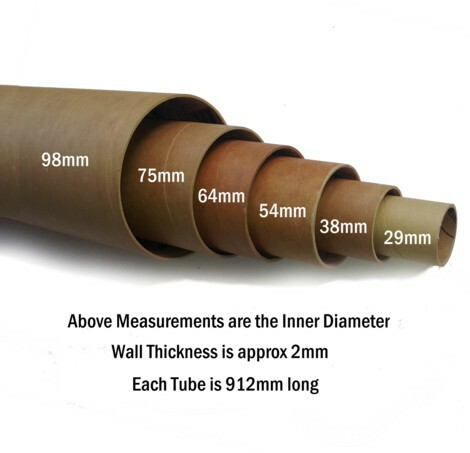 Item is one length of phenolic tube 98mm inner diameter x 912mm long. Phenolic tubing is a resin impregnated, spiral wrapped, and heat cured tube. It is much stronger than cardboard tubing, with almost five times the compression strength. It is also a very good base for rockets that will require the strengthening of fibreglass, Kevlar, carbon fibre, or similar materials. For this reason, phenolic is recommended as the appropriate tubing for rockets that are 150mm,188mm, and 285mm in diameter, or rockets that will require strengthening for the rigors of transonic or supersonic flight. Phenolic tube is also recommended for for transonic or supersonic flights in kits of 29mm through 64mm diameter, as phenolic can withstand those flights without strengthening in most instances. PML Phenolic tubing is very heat resistant and is highly recommended for motor mount tubes and minimum diameter applications. For any rocket 29mm through 64mm diameter regardless of speed. For any rocket 75mm through 285mm that will not exceed 0.85 mach. For any rocket requiring extensive fibreglass, Kevlar, or carbon fibre reinforcing.